Food blogging can have many rewards - wonderful comments from readers, speciality food items to try, or even a trip to see product production. 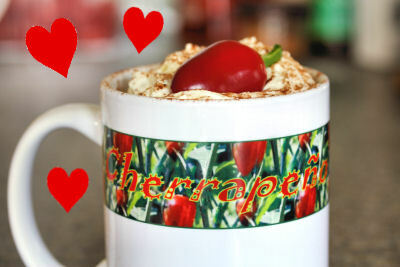 One of the most thoughtful (& delightful) things I received recently was my own special Cherrapeño mug, printed with my banner. I LOVE IT!! The mug was courtesy of Forever Better - thank you - and was accompanied by some lovely cupcakes, there was even one with Cherrapeño banner icing, unfortunately it had got so squashed in the post I was unable to take a photo. 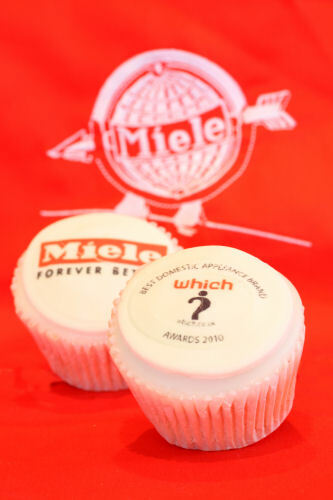 It was all part of celebrating Miele's recent award from Which? 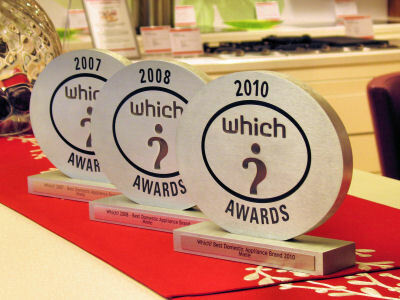 where they won the Best Domestic Appliance Brand Award for the 3rd time in 4 years! I attended the champagne celebrations at the Miele showroom in London, with camera but minus battery which was still sitting at home on charge :( fortunately I did have a little back-up camera so you can see the award they received. It was a super evening and my first time at the London showroom, which is rather grand and in a great location, just off Regent Street. Miele are sponsoring the MasterChef Experience at this year's BBC Summer Good Food Show in Birmingham, 16-20th June 2010, where you can take part in the famous invention test and create a dish in front of a live audience, with the best dishes being tasted by John Torode and Gregg Wallace themselves! 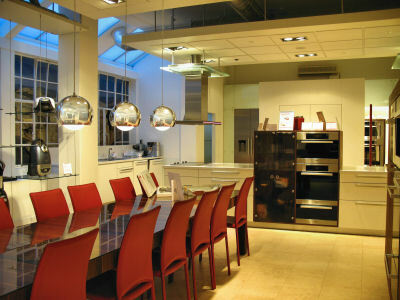 Don't forget to pop by the Miele stand and say hello. Your mug looks so much prettier than mine, must re-design my banner! That is just too darned cool Nic! WOOT! What a great idea! Hope to see you on the show. lemme know if u are on, and when, and I shall watch live streaming! FUN FUN FUN!! Your banner lends itself to being printed on a mug Nic - it looks really impressive. Next time I go to London, I think a trip to Regent Street will be on the list! Wonderful mug - I've always like your banner. I still haven't worked out how to have a banner - I tried adding one of my photos but it just messed everything up so I gave up on that particular project. The cupcakes look really cute too - shame you didn't manage to get a photo of the extra special one. aforkfulofspaghetti - ha, I already did! It's mine from now on though! Valli - I will be for sure! Anne - better get yourself a colourful banner, lol! We must get together soon. Mary - welcome to my blog, it's great to see you here. Thanks for the lovey words. Sunita - oh that would have been great to catch up again! Deeba - isn't it? By the way, don't look for me as I can't make it this time, lol. Sarah - we should have a tea party and all bring our own (personalised) mugs! Margaret - thanks and yes, do call in there if you love great kitchen appliances. Your mug is fantastic. What a wonderful surprise.